Ever Play a Show at Brass City Records? Since they formed in 1987, Japan’s Guitar Wolf have been cranking out gonzo garage punk that rocks people to their very core. Equal parts the Ramones, rockabilly, garage punk and inspired by the hard rocking spirit of Joan Jett (there is a reason they call themselves the “greatest jett rock band on the planet…well they might be the only one, but still…) these veterans of true rock’n’roll craziness or “lock’n’loll” as they say in many of their wonderful songs have been destroying stages and their fans eardrums by taking their influences and turning it to 11 and getting down to business. In Japan, they are huge, over here in the United States they are more of a cult act, but that shouldn’t stop you from coming to the show on May 14 at Daniel Street. 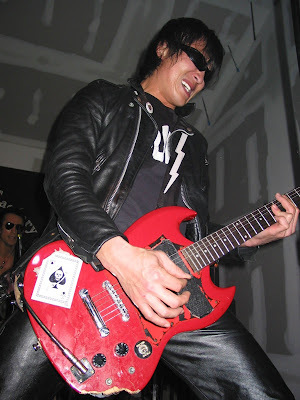 If you need further evidence, remember that the awesome garage punk label Goner, was originally started to bring Guitar Wolf to the United States. Since then, they’ve recorded for Matador and Narnack here, while being a mainstay on Sony in Japan. Personally, I’ve never seen them live; I’ve only heard testimonials from people who have witnessed their spectacle. For me, this is a chance to catch one of the legendary acts of the gunk punk set right in my home state, which I think is kind of cool, because usually international bands in the GW’s position only play the major cities when they come over to the States. We’re very lucky to get them, and for me, I’m not going to miss this. But why should you go? If you want a loud, pure and fun rock’n’roll experience then you should be at the show. I managed to snag a copy of “Golden Black”, their “greatest hits” package that came out a few years ago in the states (some of their older records are somewhat hard to find) and I can’t stop listening to it. It’s every thing you would want in a garage punk band. The songs are loud, fast and catchy. Though sung in Japanese, you get over that pretty quickly and just revel in their trashy fun. And they have been around long enough to be an influence on younger, snottier bands. If you go to Boris’ “Pink” album that came out a while ago on Southern Lord, some of the louder, punkish numbers sound like they were influenced directly by the Wolf, plus there are bands like Thee Michelle Gun Elephant, who for a while looked liked they primed to take over the US years ago, who mine that whole blown out rock sound to great effect. Plus, they will have copies of their newest record at the show. So here’s your chance to grab a little bit of the Wolf, and then go back and discover the rest of the back catalog. Also, they are coming off a storming set at Gonerfest last year, so despite their age, they still can deliver the goods live. So this show is a no brainer. Just be there.